The first keg has been tapped and the beer is flowing as the 185th Oktoberfest gets underway in Munich. Around 6 million visitors are expected at the festival grounds in Munich before the Oktoberfest ends on Oct. 7. See photos. Around 6 million visitors are expected at the festival grounds in Munich before the Oktoberfest ends on Oct. 7. As in previous years, backpacks and large bags are banned for security reasons. Beer prices are up again, with a liter (2-pint) mug costing up to 11.50 euros ($13.50) — a 55-cent increase over last year. 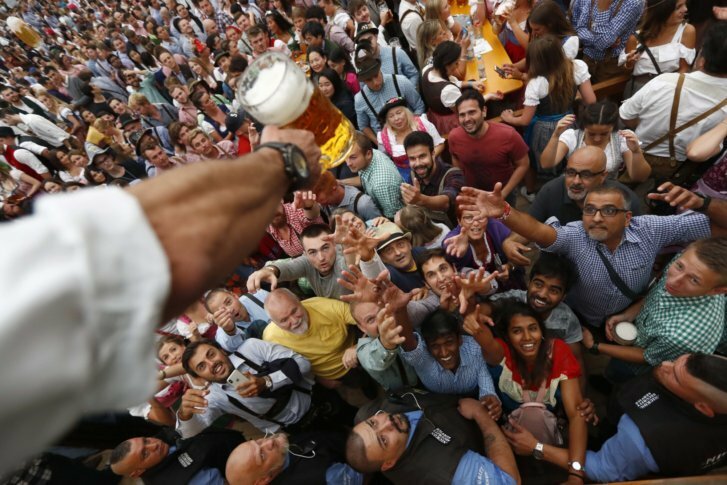 Hundreds of visitors, most of them wearing traditional lederhosen or dirndls, waited to be let in the festival grounds early Saturday morning ahead of the official keg-tapping at noon. Some 600 police officers and hundreds of stewards will keep order at the fenced-off grounds over the 16 days of the event.